If you’re a thriller fan who likes to win free books, you’ve come to the right place! 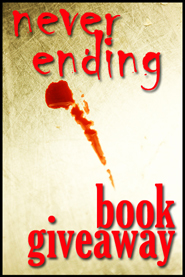 Sign up for as many of the contests listed in The Big Thrill’s “Neverending Book Giveaway” as you like! Just post a reply to each contest you hope to win, and you’re entered. PLEASE NOTE: The contests and drawings posted in this section are run by the individual authors. Arrangements for selecting winners and prize fulfillment are the responsibility of each contest poster. Also, unless a contest specifies that it is open to international readers, due to postage issues, winners will be selected from Canada and the U.S. Remember to scroll to the bottom of the list, then CLICK HERE for a second page of contests and giveaways!